Located 25 miles north of Columbia Falls, MT along the western border of Glacier National Park, Polebridge and The Polebridge Mercantile, called The Merc, give you a glimpse of life of years gone by. The population of Polebridge is no more than 100 and that’s during the summer high season. Don’t expect the usual amenities during your visit to Polebridge as any place you find with electricity is making their own, either with a propane or diesel generator, or solar panels, or possible even a water wheel. And phone service? Don’t expect to use your smart phone. Cell phone service is non-existent but if you’re lucky enough, you might find a place close enough to the Polebridge Ranger Station located inside Glacier Park with land line service. Yes, land line service comes from a phone line laying on the bottom of the North Fork of the Flathead River connecting Polebridge to the rest of the world. And, you will actually find a pay phone just outside The Merc – yup a real live working pay phone. How about plumbing? Get used to the facilities or lack there of. Yes, the only public bathroom in Polebridge is a 2 unit outhouse – one for men and one for women. But they do provide hand sanitizer. And heat? Be prepared to spend time gathering firewood. We always say gathering your own firewood heats you three times – once when you cut and gather it, once when you split it, and finally when you burn it. On the bright side, there’s nothing like wood heat – it’s cozy. So how did Polebridge, a town located in one of the most remote places in the lower 48 states, come to be. Settlement in the area started in the late 1800’s. Rumors of gold created a minor gold rush when a gold nugget was found in a quartz outcrop in the Quartz Lake area, although no quantity of gold was discovered beyond that. And then there was the discovery of coal in the Coal Creek area. But the quality of the coal was poor, thus short lived. Some of the coal miners cleared a few of the mining cabins and tried to ranch but due to poor range and severe winters the ranches were soon abandoned. An oil seepage was reported near the head of Kintla Lake which created a minor oil rush, but do to drilling difficulties, this prospect was abandoned also. Some of the folks that arrived during these rushes stayed on and set up settlements in the meadows both on the east and west side of the North Fork River – now the western boundary of Glacier National Park. They lived off the land – hunting, trapping, farming, and picking up the occasional quick income job when it came along. One noted settler was William “Bill” Adair. He originally settled on the east side of the North Fork River in 1895 and established a general store and hotel on land he leased. It was a 2½ story log structure with living quarters for the Adairs. Four bedrooms, and a large dining room to accommodate travelers venturing up the North Fork. In 1901, a road was constructed on the east side of the North Fork River starting at Belton. They called this road the North Fork Truck Trail which made access to the North Fork area easier. It was a narrow path, one track, cut through the forest over rocks, stumps, tree roots, and chuck holes with corduroy bridges – logs laid down across wet meadows so wagons could cross without sinking in the mud. River crossings to the west side were at the Hinshaw ford across from Akokola Creek and the ford at the Quartz Creek outlet. The Forest Homestead Act of 1906 provided the opportunity for settlers in this area to acquire 160 acre plots to establish permanent settlements on both sides of the North Fork River. Many settlers took advantage of the Homestead Act and by 1910, when Glacier National Park was established, there were 14 homestead claims on the west side of the North Fork River and 44 homestead claims on the east side of the North Fork River. After Glacier National Park was established, homesteading inside the Park was very limited and some of the homestead claims were relinquished simultaneously. These claims became known as inholders and an early Park policy was not to bother these homesteaders but that would change over the years. These homesteaders petitioned the Park Administration to exclude the North Fork area of the Park from being part of the Park but the government was unreceptive to this idea so many of these inholders relinquished their homestead claims and moved to the west side of the North Fork River. Most of the homesteaders were hunters and trappers and worked seasonal jobs with the Park Service and National Forest Service. These jobs consisted of cooks, fire lookouts, forest fire fighters, and packers. One homesteader, Kid Fredericks, a former prize fighter, built a log gymnasium and ran a boxing camp for local youth hopefuls. Another homesteader, George Grubb (originally from Texas), added log cabin building and bootlegging to supplement his trapping income. In 1913, a 400′ pole bridge was constructed by the homesteaders over the North Fork River; however, it only lasted one season. The pole bridge was rebuilt in 1916 by Flathead County. Construction of a road on the west side of the North Fork River began in 1913 and was completed in 1915. The completion of this road led to more homesteading claims on the west side of the North Fork River. Bill Adair’s land lease inside Glacier Park came up for bid in the early 1900’s but he was outbid and filed a homestead claim on the west side of the North Fork River and built his homestead cabin on his claim where he lived with his family. In 1914 with help from community members, he built a mercantile known as Adair’s. His wives (his first wife died and he married again) ran the store while he fished, drank, and grew giant cabbage. A half mile north of Adair’s Mercantile towards the Glacier Park entrance, Ben Hensen Sr built another store in 1920 thinking Adair’s prices were outrageous. He won the post office contract and his wife submitted to name their store and post office Polebridge, and was accepted. During the Depression, he closed his store and the Polebridge post office moved to Adair’s. Adair’s Mercantile was more than a supply store, grocer, and post office, it was the community meeting place. It was where homesteaders in the area would stop to eat on their all-day trip to Belton (now West Glacier). Adair owned the store until just after WWII. Ben Rover purchased it in 1943 and operated it for several years. Adair’s original homestead cabin served as the residence for owners of the store until the early 1950’s when living quarters were built above the Polebridge Mercantile. 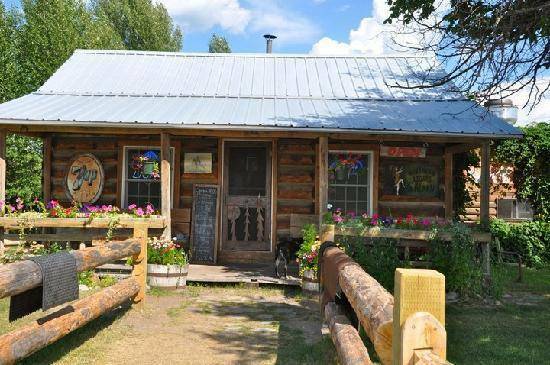 It was a rental cabin until 1976 and then converted into a restaurant now called the Northern Lights Saloon & Cafe. Adair’s original homestead had 3 other buildings on it – an ice-house, a shop, and a barn. The barn burned to the ground during the Red Bench Fire of 1988. The buildings on Adair’s homestead make up the W. L. Adair General Mercantile Historic District and was placed on the National Registry of Historic Places in 1986. Inside, The Merc still bears the hand-hewed logs by Bill Adair. 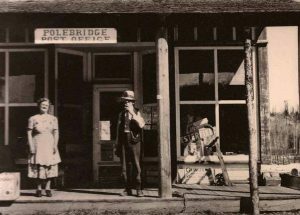 The Polebridge Mercantile, known as The Merc, was purchased by Dan Kaufman in 1991, a third generation baker from Idaho. 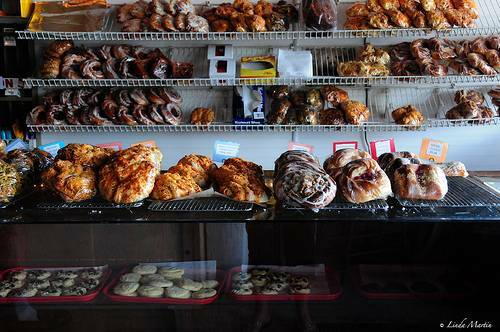 He established a bakery in The Merc which is now the feature of the Polebridge Mercantile. After 15 years, Dan sold The Merc but the legacy of his recipes has lived on through subsequent owners. It is currently owned by a Kalispell, MT native, Will Hammerquist, and this unique bakery still exists. It produces many different kind of pastries – both breakfast sweet rolls and lunch savory rolls. They also have a wide variety of cookies, bars, and desserts. A very unique experience indeed. The town of Polebridge now consists of a few year-round residents and mostly summer-only residents. 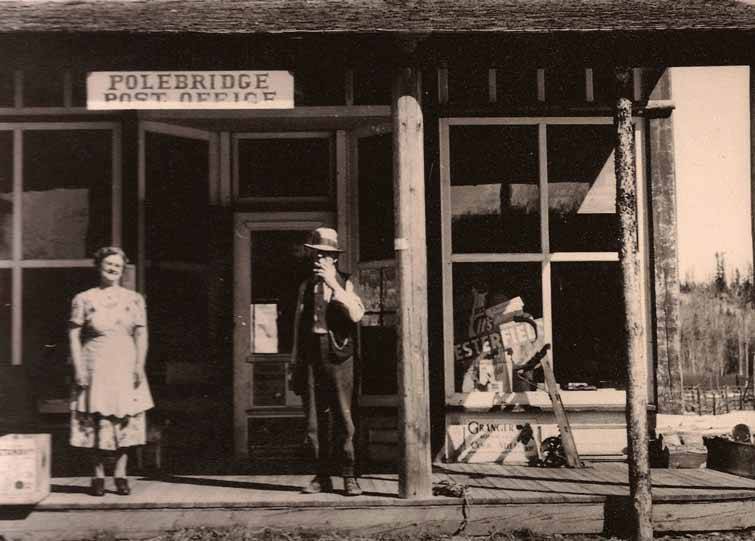 The Polebridge Mercantile and the Northern Lights Saloon & Cafe still remain the social center of the community. Besides the many hikers, campers, and visitors to Glacier National Park that visit Polebridge each summer, the town has a couple of noted annual events. One of these events is the 4th of July Parade through town passing in front of the Polebridge Mercantile. It is a parade like you’ve never experienced before. They also host the Root Beer Classic Dog Sled Race in March, snow permitting. 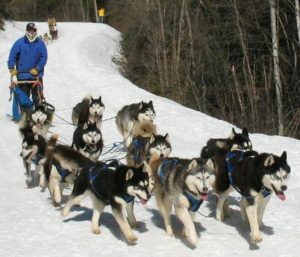 It’s referred to as our local Montana Iditarod. You can enter 12 dog teams, up to 6 dog teams, and up to 4 dog teams. It’s a fun event with a grand prize of a bottle of Root Beer. During your visit to Glacier National Park, plan a trip to Polebridge, it will be an experience you’ll not soon forget.